Service packages can be customized to suit your current needs. We begin with a thorough background analysis. This helps us understand your competition history, goals and current level. Through conversations with Ann, video tape analysis, and when desired, visits to our training facility, we evaluate both horse and rider. This scrutiny allows us to create a routine that highlights your strengths as a team. Equestrian Arts offers full music research services and digital production facilities. We work with you to select the most appropriate and complementary music for your ride. Once the proper music is selected our production staff integrates it into a digital quality package complete with seamless edits and special effects. These technical innovations allow us to control the flow of musical movement and create the ultimate in quality presentations. A complete choreography will be developed by Ann, any and all rider input is welcomed here, to bring out your star quality. These choreography techniques are designed to help you gain scores in technical difficulty and execution. Ann's creative programs stress imaginative use of technical requirements and highlight your horse's strong points. For those with existing freestyles, Equestrian Art's offers consulting services to help you polish and upgrade your routine or your musical presentaion. Ann is a US Dressage Federation Certified Instructor and serves as a faculty member for USDF Instructor Certification, conducting workshops throughout the US. As a committee member of the USDF, Ann has served as chair of the Certified Instructors Committee, the Test Writing Committee, and currently is chair of the Musical Freestyle Committee. She is also an "A" graduate of the US Pony Club, and has mentored many young riders in their progress through the Pony Club ratings. Ann and her husband Ed Iarusso own and operate Equestrian Arts Productions, a musical freestyle company. Ed is a professional musician with over 30 years experience in the field. Ed has recorded in Nashville and New York and his pedal steel playing has been featured on music videos on TNN. Ed plays the Pedal steel guitar and dobro and is currently actively performing with two bands: The Shinolas and Sixteen Tons. 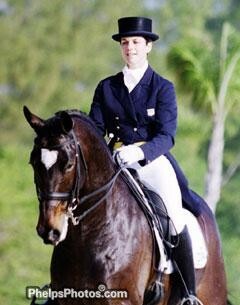 Pairing their riding and musical talents the couple produces musical freestyles for all levels of dressage. In 2003 Equestrian Arts Productions sponsored and produced an educational and promotional video for the USDF "Musical Freestyle Fundamentals". This video can be viewed on USDF E-Trak. Ann and her family own and operate Fox Ledge Farm, a dressage boarding and training facility. You can reach them by email at eqarts@snet.net or contact us here.